At Questionmark’s European Users Conference in October I took part in a panel discussion on security in assessment. During the session we polled the audience on a number of questions concerning their own security practice. Lots of interesting points came up but one stuck out to me. Most people in the audience had a formal code that applied to the participant’s conduct during assessments. For an employee engaged in a training program this would be covered by a contract of employment and the organization’s operating manual. For a student at a University it is more likely to be some type of agreement entered into when the student registers. Plagiarism is a particular concern now the web provides such an easy way to share information. Likewise, most people reported that misconduct on tests would have significant consequences for the participant. Given these two responses, I was surprised that a minority of the audience used a simple reminder of participants’ obligations before allowing them to proceed with the test. Most high-stakes testing programmes that I’ve been involved with have had comprehensive rules governing the physical environment used to take tests (whether on paper or on computer). These rules invariably involved placing notices reminding people of the rules of conduct. Of course, most candidates do not stop to read these notices at the time of the exam, but they do help to remind people of the rules they have already signed up to. As someone involved mainly in the technical side of assessment systems I often hear requests to make the technology stronger against misuse. More encryption, more control over devices, etc. These solutions play a part, but we often ignore simpler changes to improve detection. It may be hard to remove every opportunity a participant has to cheat, but if you can increase the chances of them getting found out then you can still reduce misconduct. Think of an unlocked room bearing a simple sign “no unauthorized admittance”; add a sign that says the forbidden room is monitored, and the temptation to trespass is reduced. As someone involved in assessment, I’m mindful of the fact that we all want our participants to succeed and that every case of failure through misconduct is, in some ways, a failure of the system itself. 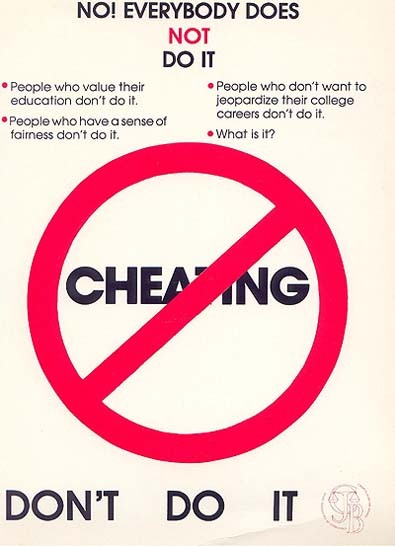 Presenting participants with a brief reminder of their obligations and the fact that their conduct is monitored just before allowing them to proceed with an exam should help persuade the wavering participant that cheating is not in their best interests. Incent originality rather than dis-incent plagiarism. The largest problem with standard measures is how ruthlessly they deal with creative solutions, and some of those solutions precisely overlap these prescriptions. An original solution – out of the box (whether it be a multiple choice box or a prescribed verbal measure) is usually more valuable anyway. The best way to highlight quality is to show it off: publish the best as they walk into the assessment. Show off the most original, most creative, most daring, and highest risks taken.